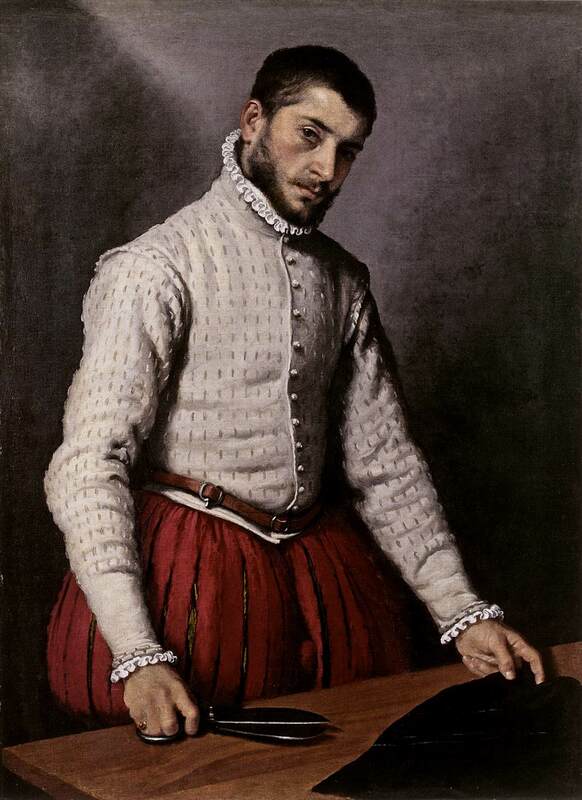 Giovanni Battista Moroni was born and died in the city of Bergamo, in northern Italy. Despite he traveled throughout the country, the artist was practically isolated from the cultural centers of the time, such as Venice, Florence or Rome. In the city of Bergamo, Moroni became one of the few professional artists in town and, because of that, the received constant commissions to portrait members of the local aristocracy. These portraits are now known for their psychological insight, their colors and for the dignity he granted to the characters. I like The tailor because it has a special characteristic: it was one of the first works which portraits a worker. Until that time, the artistic motifs could be basically resumed in mythological, religious and in portraits of the bourgeoisie. But Moroni portraits an unknown character. Far from a nostalgic or compasive vision, the artist dignifies an artisan of the lower class of the society. While he is preparing to cut a black fabric, his eyes look at the spectator profoundly. This gives him an air of nobility and confidence. Moroni portraits the tailor dressed in the Spanish fashion and, ironically, adds him a sword belt. The irony is that the nobles posed with swords to show their bravery and power, but the artist rather is showing us that the power of the tailor lies in his work tool, his scissors. On the contrary of Titian and Michelangelo, who at the beginning of the century compared themselves with princes, Moroni identifies himself with humble artisans and workers. You can find the painting in high resolution in Google Art Project®. ~ by Álvaro Mazzino on May 18, 2011. When it comes to other specifications, Sam Mobile reports that Samsung’s second-generation tablet will have a 4:3 aspect ratio display and a stunning Super AMOLED feature. This entry was posted on May 18, 2011 at 10:29 and is filed under Mannerism.You can follow any responses to this entry through the RSS 2.0 feed.You can leave a response, or trackback from your own site.